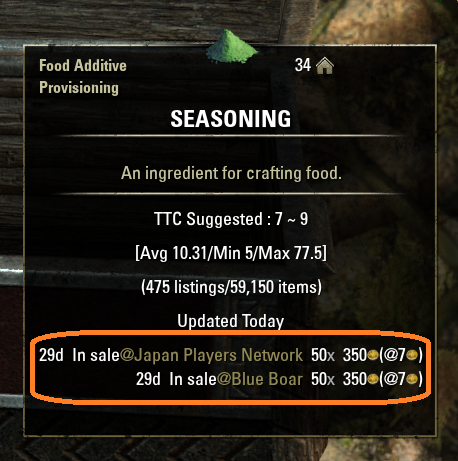 that you are selling to the guild store. However, it is very useful when purchasing products from Mr. Rolis Hlaalu! 1.Improved the screen refresh process. Fixed an issue that caused an error on the first start. 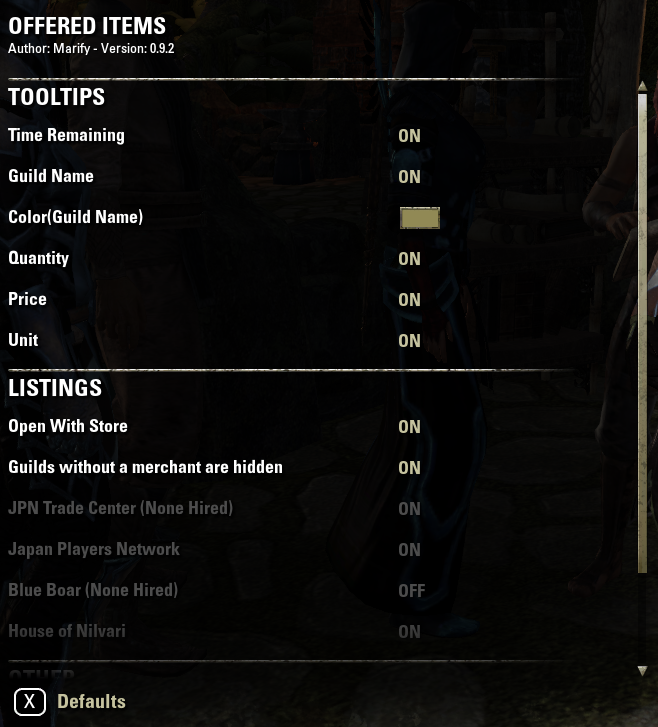 1.Added Add guild selection dropdown. 2.Added Window size change button& scroll. Fix the phenomenon that the window position goes wrong. Would It be possible to show the information in the sales window along with the listings window. 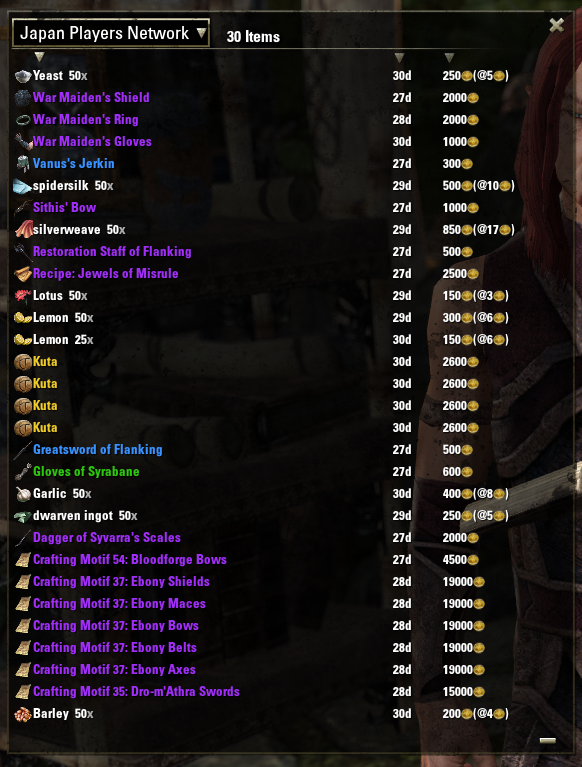 I belong to 4 trading guilds and it would be helpful to check what I have the other prices listed in each guild. 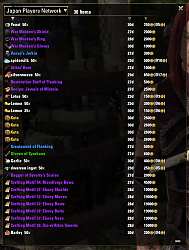 you can see the other prices in the item tooltip or open the list with hotkey. or do you mean the price history? 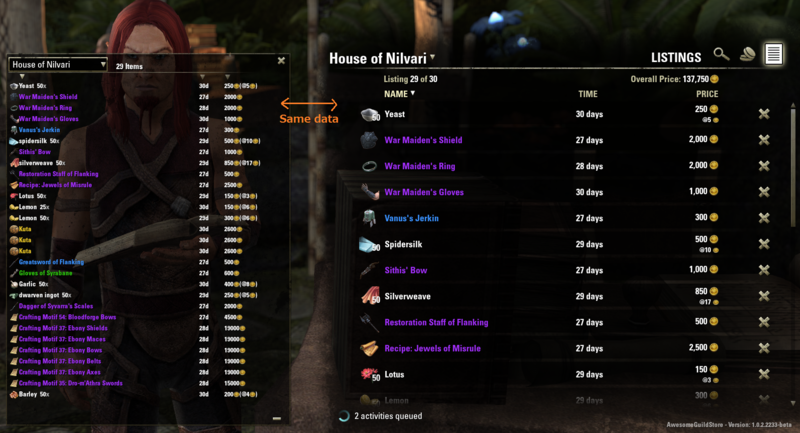 I will first create the function to display the mark in the inventory list. can consider it next time. Is it something like the image below? Sorry I wasn't clear before. I meant in the tool tip. 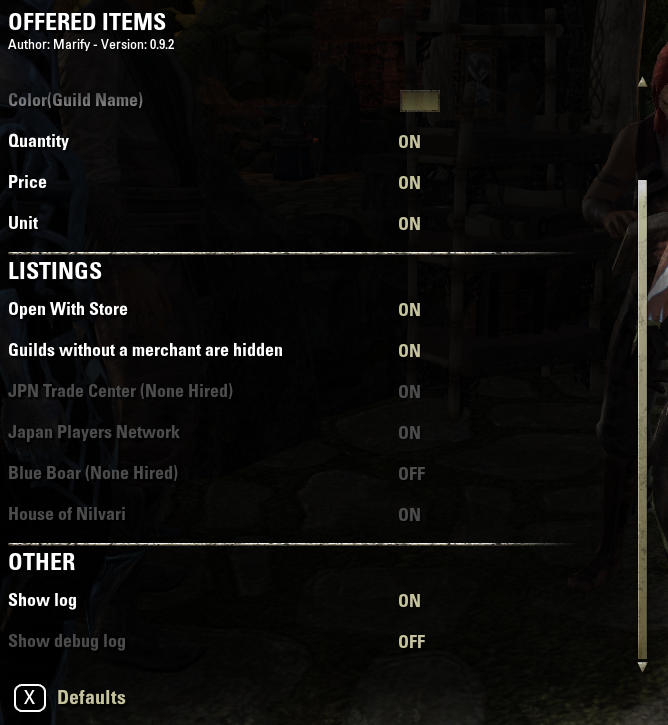 In the Guild Store window the listing ( sell tab ) of what you want to sell in the tool tip. Not just what is posted already for sale ( listing tab ). 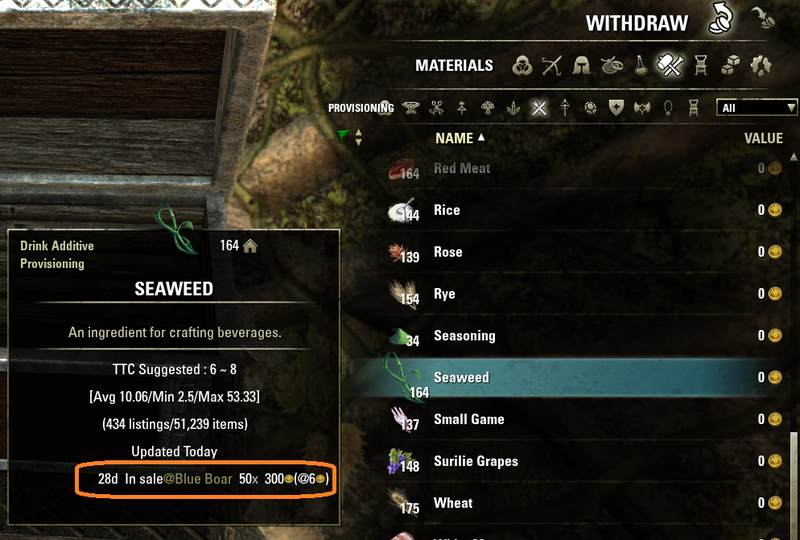 I find this addon very useful. Also there seems to be no option screen showing up. I use Minion to install my addons. Wow this is amazing, thank you so much! 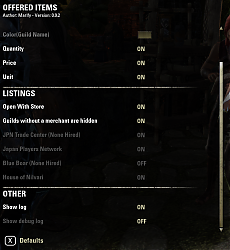 - To updated the list by checking the sold items, like Master Merchant and/or Arkadius Trade Tools do. 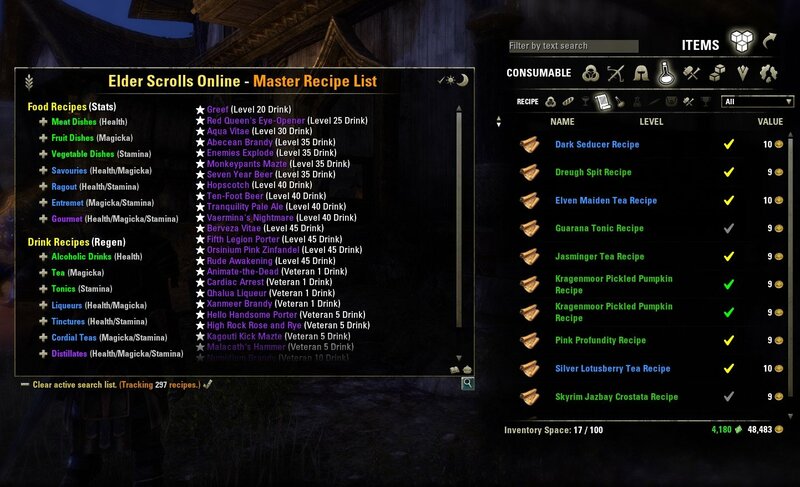 I should say this, that Arkadius Trade Tools is better on doing that since it does not lag the game at all. 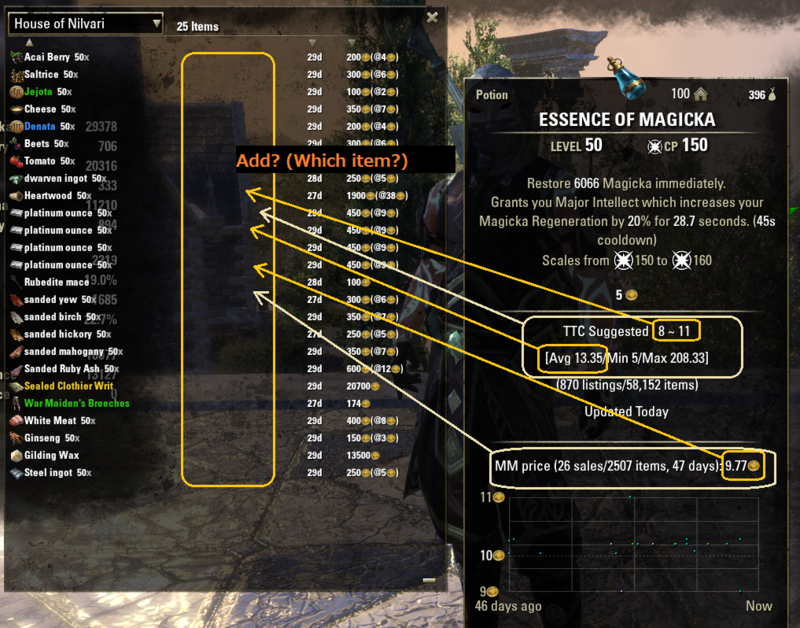 --- Tho this can overload a bit the system since usually people that will use this addon also have MM or ATT. Indeed this is amazing, even the way it is now it is great. Please dont feel forced to do this modifications. I liked this suggestions below too. but has the same problem as TTC and MM. Product sales history is regularly updated on the server side. However, it is updated later than the sales notification by email. But even without these changes thx for the addon. really enjoy it so far. I do not know how to put a scroll list inside a tooltip. I think that's probably impossible. Thank you for the release. Working fine so far, and its perfect timing because of the anniversery event. Will let you know if i can find any bugs but at the moment i think its working fine. 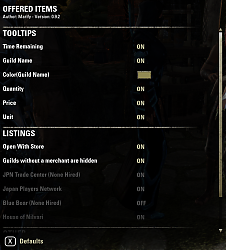 One small request you could think about would be to make it possible via settings to auto-open the display of listings on guild trader and banker scene, so there is no need for a hotkey in the main use cases. Re: Where does it pull from? This looks really cool. What data does it pull from? MM, TTC? Or does it create an entirely new database for itself? I'm wondering how it updates the data (i.e. when seasoning is no longer for sale in blue boar). This is the same as your guild merchant's data. In other words, the price you set. Where does it pull from? 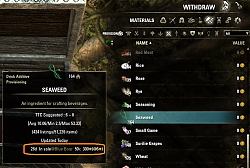 the reason is because there are some really long tooltips if you have a lot addons where the tooltip-text is not seen very good in certain items. Last edited by Gamer1986PAN : 04/07/19 at 04:07 PM. Last edited by Chuaznega : 04/07/19 at 07:26 AM.